3D-Micromac AG, the industry leader in laser micromachining and roll-to-roll laser systems for the photovoltaic, medical device and electronics markets, is presenting its high-throughput microFLEX laser systems for processing of flexible solar cells at the SNEC 2018 International Photovoltaic Power Generation Conference & Exhibition, to be held on May 28th-30th in Shanghai, China. The highly versatile microFLEX production platform is the all-in-one solution for the manufacturing of flexible thin films in photovoltaics. It combines high-precision laser processing with cleaning, coating, printing, and packaging technologies as well as inline quality control. Due to its modular concept various customized solutions are available, reaching from industrial mass production to pilot lines as well as applied research. 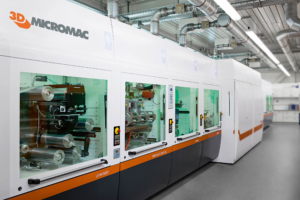 In addition to showcasing the microFLEX system, 3D-Micromac is presenting its highly productive microCELL systems for laser processing of wafer-based crystalline solar cells. The microCELL production solutions, such as high performance laser processing of Laser Contact Opening (LCO) for high efficient PERC solar cells, laser doping as well as defect free laser cutting of full cells into half cells with Thermal Laser Separation (TLS), are designed to meet cell manufacturers‘ demands for achieving maximum throughput rates and yield while diminishing cell manufacturing costs. SNEC attendees interested in learning more about these products are invited to visit the company’s booth #E3.106 at the Shanghai New International Exhibition Centre.